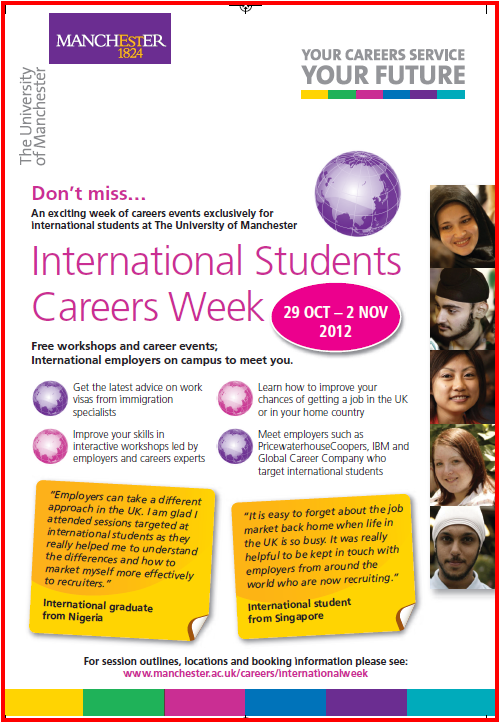 Reading week (29th October – 2nd November this year) is international students careers week at The University of Manchester. Log into Careerslink (our database of the latest jobs and events coming up) and you will see the full programme. From this week you can also now sign up for a place at all events listed. It’s always popular, with over 600 students getting involved last year and we hope you will get involved this year too. Making a positive impact when job hunting? – this is a great session if you are quite new to the job hunting process, maybe lack confidence or just want to know how to make a positive impression through the selection process. Working in the UK – work visa regulations – find out about the Tier 2 visa process in more detail from an immigration specialist. What do you have to do, when does it need to be in place? A great opportunity for free legal advice too. Getting a professional job for Chinese students with Mandarin Consultant. This recruitment firm will share their secrets to getting in with both UK and China organisations. Hear from the experts. To see the full programme see: www.manchester.ac.uk/careers/internationalweek and sign up for session places on Careerslink. If you have not heard of careerslink before it is the Careers Service’s database of the latest jobs and events. There are job vacancies for around the globe too, so it’s not just the UK! You can access Careerslink at www.manchester.ac.uk/careerslink (log in as a student with your university username and password). Amanda Conway is the Head of International Career Development at The University of Manchester. Amanda has been a career consultant at the University for over 15 years and also has a background in retail management and HR, psychometric testing and personality profiling. Thanks Amanda for useful & interesting information.